It’s been 20 years since World Championship Wrestling (WCW) and World Wrestling Federation (WWF) engaged in the Monday Night Wars, but it’s an era that lives on in the hearts of wrestling fans all over the world. One of the men responsible for WCW nearly taking down WWF, and actually dominating Vince McMahon’s company for 83 weeks, was Eric Bischoff. After pushing WWF to the limits with the creation of the New World Order (NWO) and wrestling legend Bill Goldberg, Ted Turner’s WCW was eventually overtaken in the ratings and purchased by McMahon putting an end to the Monday Night Wars. After the demise of WCW, Bischoff was a regular fixture as a general manager of Monday Night Raw after McMahon rebranded the company, naming it World Wrestling Entertainment (WWE). From 2002 to 2005 Bischoff feuded with McMahon and WWE stars such as Stone Cold Steve Austin, Chris Jericho, and many others. He appeared on WWE TV sporadically from 2006-2007, eventually heading over to Total Nonstop Action Wrestling (TNA) where he negotiated a deal with the company, himself and Hulk Hogan. Bischoff was a regular fixture on TNA from 2010-2012. He made a return to WWE in 2016, when the company released a documentary DVD on him. He also inducted Diamond Dallas Page into the WWE Hall of Fame on March 31 of that year. In January of 2018, Bischoff appeared on Raw 25 with a segment featuring former Raw general managers. Bischoff is still a prevalent figure in the world of wrestling, as he does a weekly podcast called 83 Weeks with Conrad Thompson. The podcast chronicles the 83 weeks that WCW engaged in the Monday Night War’s with WWF. The duo will be appearing at Off Broadway in St. Louis on Saturday, February 23 for a live show of their podcast. Bischoff admits he was hesitant to do the podcast at first. The 83 Weeks podcast has been a hit from the start. The decision to bring the live show to St. Louis was an easy one for Bischoff and Thompson. Bischoff was surprised to learn that WCW Monday Nitro still holds the Missouri state record for the largest crowd at a wrestling event. The show aired from the Edward Jones Dome in 1998 with an attendance of over 32,000 fans. The attendance may have been even larger if not for an ice storm that hit that December evening. The wrestling world is currently the healthiest it’s been in years, leading to a new company, All Elite Wrestling (AEW) opening shop. The company is backed, financially, by Tony Khan, son of the Jacksonville Jaguars owner, Shad Khan. He has invested $100 million, as wrestlers Cody Rhodes and the Young Bucks have signed two of the industry’s hottest superstars in Kenny Omega and Chris Jericho. Rumors are currently swirling in the wrestling world that several WWE superstars could be leaving the company to join AEW, which features a lighter work schedule and the same, if not more pay along with health insurance for wrestlers. Bischoff admitted he is like most fans, in that he has heard the news and rumors, but has no inside information. In September, Rhodes and the Bucks put together “All In” from Sears Arena in Chicago. The event sold out in 27 minutes. The 11,000 fans filled the arena, in what was the largest independent wrestling show of all-time. In today’s wrestling world, social media has become another tool for wrestlers to use in order to get over with fans and Rhodes and the Bucks have used it to their advantage. Bischoff, speaking from personal taste, said he would like to see AEW embrace the underdog role. Wrestling fans all over the world are discussing the possibility of AEW competing with WWE, but Bischoff scoffs at. 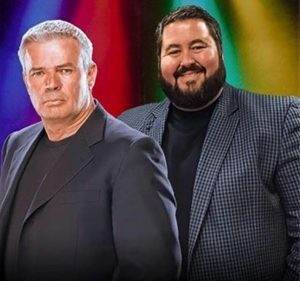 While Bischoff shoots down the idea of AEW competing with WWE, he said he believes the company can still achieve success. Bischoff went on to say that just because the Monday Night Wars cannot happen again, that does not mean AEW can’t be successful. Bischoff will also be appearing at Starrcast 2 in Las Vegas over Memorial Day weekend, the event that leads into AEW’s first show, Double or Nothing on May 25 at MGM Grand Arena. He will also be in New York during Wrestlemania weekend making appearances. Right now the hottest story in wrestling is the feud between Becky Lynch and former UFC star Ronda Rousey. Having only been with the company for 13 months, Rousey has become one of the company’s biggest stars. Lynch has also skyrocketed to fame, becoming a fan favorite on the verge of superstardom. The two will face off at Wrestlemania 35 in the main event. This will be the first time women have headlined Wrestlemania, making it a historic match and event. Bischoff said that WWE’s decision to train women wrestlers exactly like the men is a smart decision and one that has not only attracted new fans but will continue to build the WWE brand into the future. As far as the storyline and booking of Rousey and Lynch, Bischoff said it’s some of the best he’s seen in a long time. Bischoff compared Rousey’s rise to fame in WWE to the rise of Bill Goldberg and The Rock. 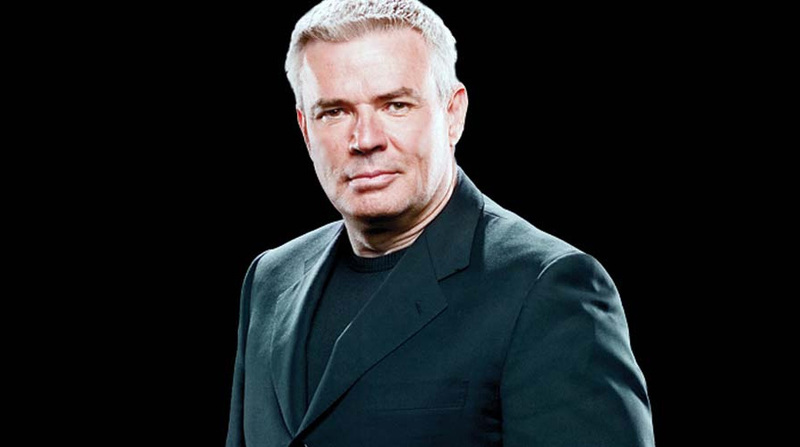 Bischoff is responsible for the creation of the NWO, which was at the time the most popular stable in wrestling. Its lasting effect on the business is still seen today, as fans still can be seen wearing NWO shirts. While the creation of the NWO has been discussed for years, Bischoff set the record straight on how the stable came to be. Scott Hall and Kevin Nash had both worked for WCW before hitting it big in WWF. Nash portrayed the characters Vinnie Vegas and Oz, both of which were unsuccessful in garnering a following. Bischoff spent a lot of time in Japan during the couple years leading up to the creation of the NWO. While many have said he took an idea he saw over there and copied it, Bischoff said that’s not true at all. At that time, while he was in Japan, Bischoff said the stories were believable and people bought into them. Wrestling was frequently the top stories in the sports section of newspapers. Bischoff said his goal was to make the WCW product believable and by coincidence Hall and Nash became available. Bischoff said that if it were not for the NWO, the Monday Night Wars never would have happened. Bischoff credits the Monday Night Wars with enabling the WWE to be where it is today. A moment in WCW and NWO history that will forever be remembered by wrestling fans is the moment that Hulk Hogan dropped the red and yellow and stopped telling fans to say their prayers and eat their vitamins, joining forces with the NWO and adopting the moniker Hollywood Hogan. It’s a moment that most wrestling fans will remember forever. It’s a moment that Bischoff was responsible for creating. After Hogan turning Bischoff down, Bischoff looked to Sting to make the heel turn. Hogan’s heel turn is considered by many wrestling fans and historians to be one of the most shocking moments in the sport. Having worked in three wrestling organizations – WCW, WWE, and TNA – many still wonder if Bischoff thinks about getting back into the wrestling business, and if there is a perfect scenario where he would make the jump back into it. With Wrestlemania around the corner, I asked Bischoff if he thinks he would ever be inducted into the WWE Hall of Fame. He said he gets that question a lot this time of year. Bischoff did say his favorite part of Wrestlemania weekend is the Hall of Fame ceremony. At the end of our conversation, I asked Bischoff what fans should expect from his 83 Weeks Live show on February 23. Tickets are still available here for 83 Weeks Live featuring Bischoff and Conrad Thompson at Off Broadway on Saturday, February 23.